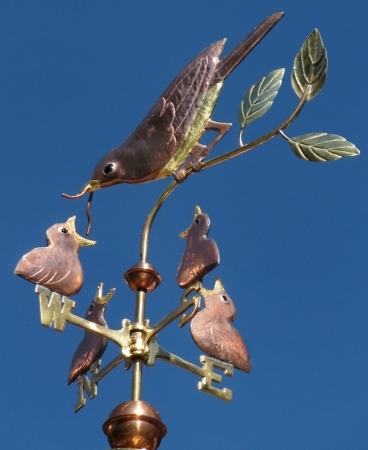 The Robin Feeding Chicks Weather Vane, Turdus migratorius, is one of my all time favorite designs. I have my own version of this vane in the small size (one-foot ~30cm sculpture piece) sitting on my desk so I can enjoy it every day. 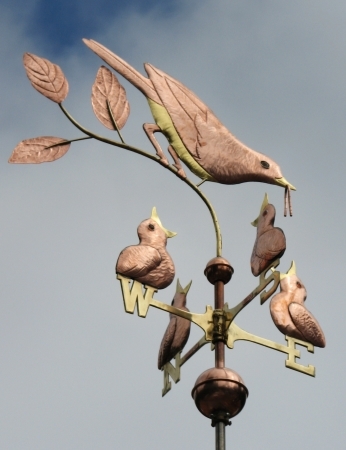 Because it features a baby chick on each directional, when placed outside, spinning in the wind, the mother robin turns and ‘feeds’ all her hatchlings. 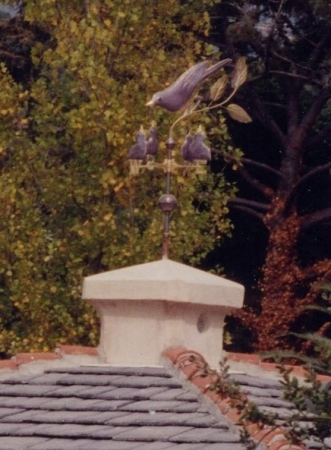 The idea of incorporating the directionals as an active element of the weathervane is an original design concept by West Coast Weather Vanes. 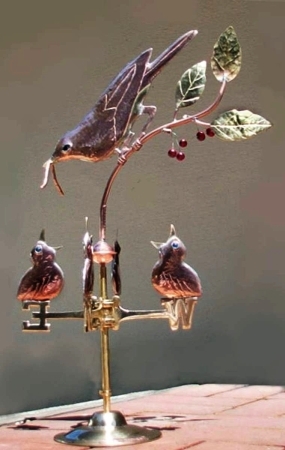 We have used this concept on a number of our weathervanes, including our Wine Bottle with Wine Glasses and our Hunting Bald Eagle. 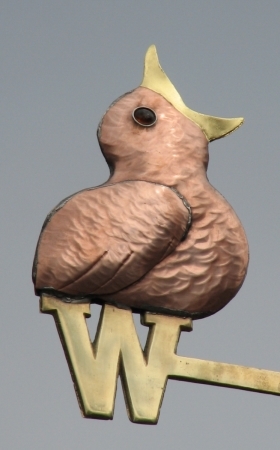 This design concept has now been copied by many other vane makers because it is just too good to resist. 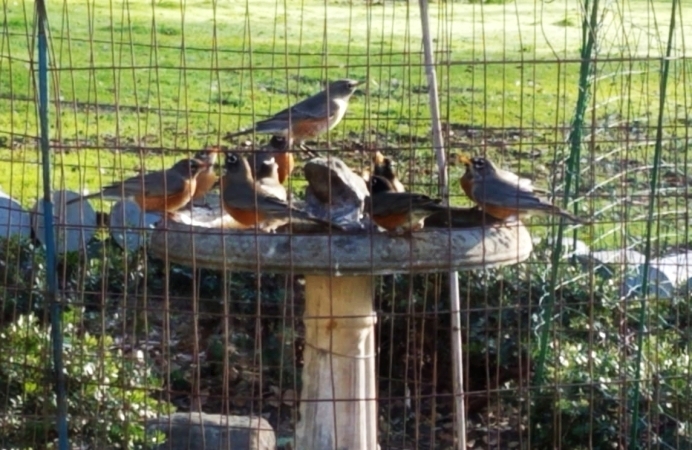 As shown here our customer requested optional gold leaf on all the bird’s beaks and the mother robin’s breast. 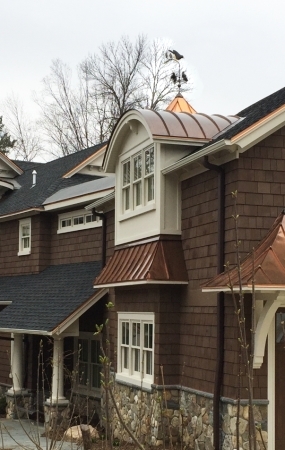 As the copper weathers to a rich chocolate brown color, the contrasting gold will look especially nice. We also used translucent blue glass eyes which looks lovely when the light is right and shines through. 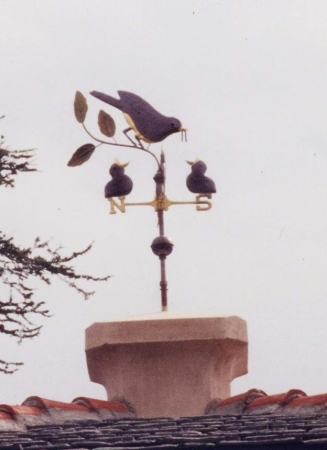 One of my favorite stories about this Robin and Chicks Weathervane is of customers whose order was for their parent’s 50th wedding anniversary. 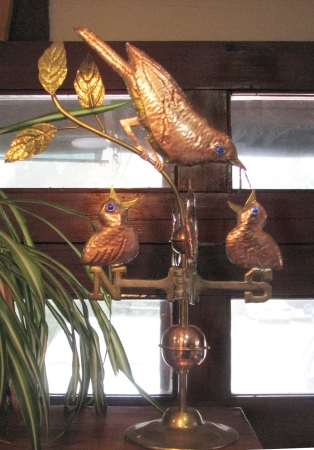 They took advantage of the Victorian Age tradition that includes a ‘lucky’ penny from the year of construction inside the weather vane to also include in the parent bird a penny from the year each parent was born, a penny from the year they married, and a penny for the year they were celebrating their 50th wedding anniversary (which was also the year the weathervane was made). In each of the four chicks the family requested we put a penny from the year the four siblings purchasing this awesome gift were born — but not just any penny — these siblings each found a penny from the year they were born and made a wish on it, before mailing them to us to be sealed within. We had to be very careful to get the correct pennies into the correct chick! 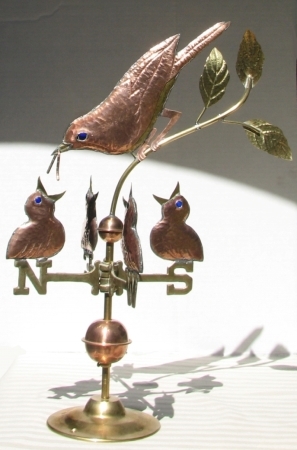 The weathervane was presented at a family reunion in honor of the Golden Anniversary and capping off a most special occasion. It really made it a unique gift. 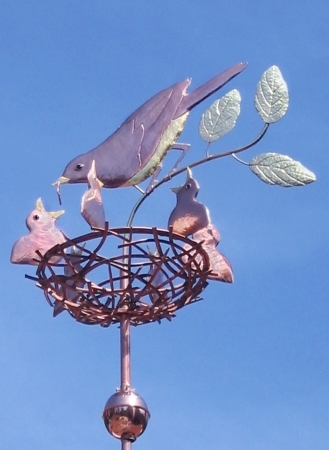 We also make a Robin Weathervane with Chicks in Nest. It was originally commissioned by customers wanting a way to represent their five ‘fledglings’ and this was a great resolution.